Today is international women’s day. It is a very special day especially since exactly 25 years ago I have met my wife Margit for the first time (in an Italian language class in Rome). So we are celebrating today, and I will tell you what wine we will drink at this special occasion. But before I come to this, let me also say that the next generation is getting ready. My two daughters Lucy and Charlotte are in the middle of their preparations for the IB examinations. They have big plans. 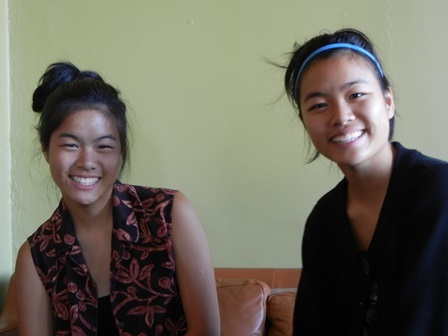 Both want to study at Melbourne University. At this, I admit, very preliminary point, both will have some connection with the land and country, it seems. Lucy intends to do an oenology course (but she will study politics), and Charlotte wants to get involved into environmental science for sustainable agriculture. If they stay course, we might welcome two new vintners at Two Hills Vineyard. This is of course the future calling, but the two have not disappointed at no time. By the way, my role has also been defined in advance: farm hand, is my destination. OK back to the present. What will we be drinking tonight? Can you guess? 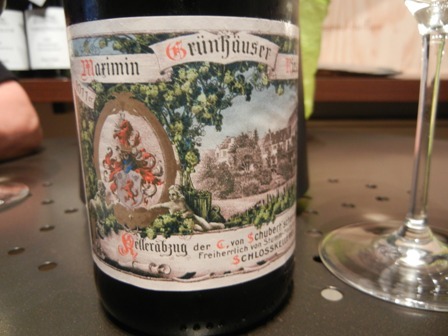 It will be a ‘2012 Maximin Grünhäuser Riesling trocken’ by Schlosskellerei Maximin Grünhaus C. von Schubert in Mertesdorf, Ruwer. I have written an entry of the earlier vintage of this wonderful wine from my beloved Mosel river. PS: Thanks to another “Man from the Mosel”, my friend Thomas Weber, I am in the possession of the above bottle. Thank you Thomas for carrying this treasure more than 10,000 miles to the other end of the earth. When we had the open day at Weingut Karthäuserhof last August, I took this photo of a spittoon in the tasting room. I do not particularly like these receptacles but in serious wine tasting they are a necessity. I will have to do more wine tastings to appreciate their usefulness, and wonder when this will happen. Does anybody have other photos of spittoon for wine to share? Cheers (despite lent, I will have a few glasses of wine in the next weeks). As a man from the Mosel, I love the Riesling wines grown on the steep slopes of the valley. This is not to say that there are no other good Riesling wines elsewhere. I also love the Rieslings from Rheinhessen, the Rheingau, the Pfalz and Alsace of course. 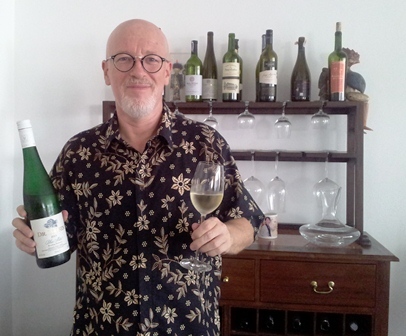 When it comes to Riesling wines from my adopted home Australia, I still had not the necessary exposure which I very much regret. Recently two Australian Rieslings won the top awards at two major wine shows in Australia. The ‘2012 Ravensworth Riesling’ a single vineyard wine produced by Ravensworth Wines, was the best wine of the 2012 Canberra International Riesling Challenge. And the ‘2012 The Lodge Hill dry Riesling’ by Jim Barry Wines was awarded the honor of best table wine at the National Wine Show of Australia. This is something. This is big. But what is even better is the pricing of these wines. The Ravensworth Riesling retails for A$ 20 and the Lodge Hill Dry Riesling for A$ 22. This is quality for money, I assume, and you need to buy now, because who knows how long this will last. 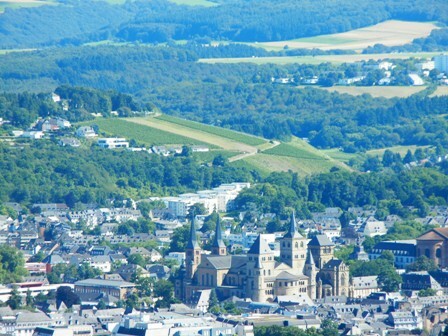 I just left my beloved Trier behind me. Now I am in Berlin, the capital of the Federal Republic which is far to the east from my native land. From Trier it is easier to reach Paris than Berlin. 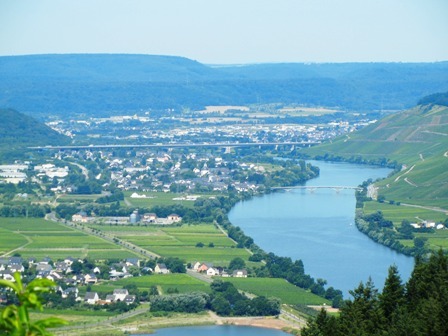 And the Mosel river comes from France before forming the frontier between Luxemburg and Germany. It is a splendid town, small and beautiful. Traces of the Roman empire can be found everywhere. Come and visit. I am rapping things up here in Bangkok. Only two more days to go. Friday night I will be on the midnight flight to Germany. After about 11 hours on the plane, I will land in Frankfurt early in the morning. I might have a coffee and breakfast at the train station. Then I will catch a train to Tier, my home town to see my parents. The train ride will be wonderful regardless of the weather. Autumn might extend its magic with colourful leaves in red, brown and yellow. First, my trip will lead me along the Rhine river, then I’ll change trains in Koblenz. The next leg of the journey will be along the Mosel river. Some of the views will be spectacular. I will admire the vineyards of both valleys, the Rhine and the Mosel. On the hilltops will be castles here and there. The slopes are steep, and I will think of all the hard work the vintners put into their vineyards. How can one work these terrible steep slopes? Backbreaking work, done for generations. Vineyards and wine production have been a feature of the place for more than 2.000 years, incredible. I will have only about 24 hours there before I will move on for a business trip to Berlin. Saturday night I will patronize my favourite wine bar, Weinsinnig. It will be my cellar door so to speak since I plan to pick up a few bottles of my favourite Mosel wines. There will be certainly a crisp Riesling among them. I very much look forward to going home. 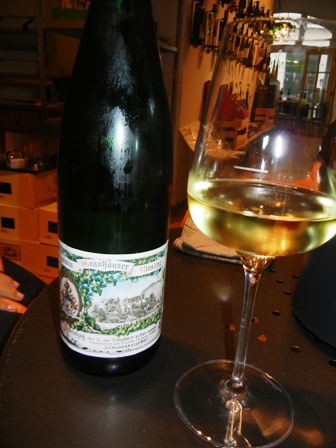 One of the nicest dry Mosel Riesling wine I tasted during our summer vacation in Trier was a ‘2011 Maximin Grünhäuser Riesling trocken’ by Schlosskellerei Maximin Grünhaus C. von Schubert in Mertesdorf, Ruwer. It was at Weinsinnig, one of my favourite wine bars in Trier, that we sampled this wine with its romantic and old fashioned label. The wine has character. Although just from their “ordinary” dry Riesling class, you get value for money (9.90 EURO/0.75 l. bottle). It has the zest, the exuberance, the fine balance of acids, the opulent aromas, the structure and long finish one longs for in a Mosel Riesling. Although I had driven past the winery many times before, I had never tasted a wine from this first class producer in the Ruwer valley. The MUNDUS VINI award for the best dry white wine in Germany 2011 and the “Big Gold Medal” were bestowed on the ‘2009 Maximin Grünhäuser Abtsberg Riesling Qualitätswein old vines’, of the estate. I wonder what this wine would taste like. But I tell you, I will return, and include some more of their wines when I visit the Mosel next time.